As time goes by and the internet becomes the main source of information the forgotten details of working class history tend to remain buried in the archives and only selectively brought out to bolster Labourist interpretations of the past. The article here takes a look back at the period immediately before World War One and includes material from local archives in the North-east and elsewhere which highlight that the ‘Great Unrest’ was not only about legendary incidents like gunboats up the Mersey but was a class-wide, country-wide, movement that alarmed the British capitalist state. From 1910-1914 Britain was racked by a series of strikes that were noted for their militancy and for their refusal to follow the dictates of union leaders. This militancy shook the British capitalist state to its foundations and forced the Liberal government of Herbert Henry Asquith to increasingly turn to military means in an attempt to halt the strikes. While the most famous examples of Government militancy was the despatching of two warships up the River Mersey following the 1911 strike of seamen there are also plenty of other examples such as the use of troops during the rail strike of 1911 in an attempt to keep scab trains operating. This period saw workers militancy break out of the boundaries of bourgeois legality and begin to start to develop towards a more critical consciousness which questioned the very basis of capitalist rule. Before going on to give a brief outline of this militancy and what this meant for the development of class consciousness it’s important to place these series of strikes in their context. The first thing to understand is that these strikes came in the wake of the end of the period of “peaceful” capitalist growth. The long economic expansion had already shown signs of coming to an end in the so-called Great Depression of 1873-96. A short boom followed but by the early part of the twentieth century wages remained stagnant whilst prices increased. This meant that workers were increasingly seeing their standard of living cut. The parallel with today is striking. Back in 1910- 14 capitalism was also at the end of a cycle of capital accumulation. However the experience by the workers of a cut in living standards does not explain why the great unrest occurred. After all, low wages were nothing new to British capitalism. Poverty alone does not facilitate militancy. Something else was required and this something else was in fact two extra add-ons. As mentioned earlier for British capitalism to successfully compete in a world market the owners had to attempt to reorganise production so that it extracted a higher level of exploitation from the workforce. To extract higher levels of surplus value this could only be done either by cutting wages or by reorganising production so that fewer workers produced more goods for the capitalist market. This was and is done to this day by increasing the mechanisation of the plant. This invariably met with resistance from workers who attempted to exert some sort of control over the labour process or resist new “scientific” management ideas like Taylorism. This combination of who will control the labour process: employer or employee, with the added pressure of the declining standard of living ensured that class tensions were slowly building up throughout British society. With the growing attempts by the bourgeoisie to increase levels of exploitation there was also a concomitant growth of socialist ideas and organisation amongst the working class. This movement arose due to the increasing disillusionment that many younger workers were experiencing with the Labour Party. After the gains the Labour Party made during the 1906 election there were great expectations that workers’ conditions would improve now that they had a voice in parliament. It didn’t take long for these ideas to be dispelled as the Labour Party in parliament cosied up to the Liberal government. While the Liberal government of Asquith introduced a series of reforms, the most notable being the National Insurance Act of 1911, they were still not enough to tackle the growing problem of both unemployment and cuts in wages. The 1906 election saw the marvellous success of Labour candidates. It did not matter to me how some had won. A new party now existed to champion the cause of Labour... Things looked rosier, and to finish up, at the 1907 Labour Party Conference, a sort of socialist resolution was carried. This gave some of us the chance we desired. Hyndman and some others of us advocated affiliation of the SDF in Justice, and supported a resolution to that effect at our 1907 Conference, at Manchester. We were defeated. This increasing resentment as voiced by MacLean towards the Labour Party allowed the growth of political organisations such as the Independent Labour Party ILP, the Social Democratic Federation SDF alongside the growth of the Socialist Labour Party SLP. While this was an encouraging development in the sense of offering a political alternative to the Labour Party the problem for the working class and especially the revolutionary minorities was that each of the organisations had serious flaws. The ILP was heavily influenced by pacifist ideas while the SDF under the leadership of Hyndman was increasingly drawn towards Social Imperialism which Lenin described as socialism in words imperialism in deeds. In the case of the SLP the flaw both organisationally as well as theoretically was their adherence to semi-syndicalist ideas. In the case of the trade unions, where the emergence of the new unionism of the 1880’s had for the first time organised unskilled workers such as Dock Workers, Gas Workers etc, by the early part of the twentieth century these organisations had increasingly turned to arbitration to resolve disputes between employers and their members. While the members looked to immediate action to solve disputes they were increasingly held back by the full time officials who urged negotiations to settle disputes. This led to increasing anger amongst the members, especially younger members who came to increasingly believe that the full time officials were more interested in negotiations rather than settling the dispute in favour of the members. In response to the union leadership’s conciliation strategy towards the employers, combined with a growing resentment towards the Labour Party’s reluctance to criticise the Liberal Party, younger union members began to be pulled towards syndicalism. For many younger workers the appeal of syndicalism was in its rejection of political parties, combined with the argument that what the working class needed was new forms of union organisation which did away with sectional organisation and replaced it with one union in one industry. The strength of syndicalism lies in the recognition that worker strength lies at the point of production i.e. the workplace while its weakness is in its rejection of political struggle. For syndicalists the point is that capitalism will be replaced after workers have staged a general strike and have taken control of the workplace. What this overlooks is that the bourgeoisie will not wait patiently while workers organise collectively. Rather, when they feel that their class interests are being threatened then they will mobilise the full force of the capitalist state in an attempt to smash workers rebellions. In fact what the employers did during the great unrest was to use their state to smash strikes such as Liverpool as well as arrest militant leaders such as Tom Mann. In the Durham coalfields young miners such as George Harvey and Will Lawther took syndicalist ideas into the coalfields to challenge the conservative DMA leadership. In the railways there was the paper Syndicalist Railwayman edited by Charles Watkins that also gave an alternative leadership. However, these ideas were inadequate to take the level of strike beyond mere economic demands and into a fundamental challenge to the capitalist state. While syndicalism had many weaknesses it did provide an organisational method for many young worker militants and can be seen in one of the first major strikes of this period which was the 1910 strike by Durham miners, which was held against the wishes of the conservative leaders of the Durham Miners Association. The miners went out on strike for eight weeks over an attempt by coal owners to establish a three shift pattern of working rather than the two shift pattern which had been established since 1890. This strike was characterised by high levels of direct action by the mining communities themselves, both men and women, against attempted scabbing. It lasted for twelve weeks and was followed in 1912 by a national strike demanding a minimum wage which again was characterised by a high level of working class militancy. While miners were fighting for improved wages and better conditions railway workers across the country were also drawn into the struggle. What began in 1911 in Liverpool quickly spread as many rail workers took strike action often against the advice of their union leaders. These strikes were also characterised by high levels of militant direct action which also involved support from the local communities. The most famous confrontation took place at Llanelli in South Wales where the entire town was put under siege by the military and it led to the death of two striking railway workers. There is also a report in the Durham Chronicle that as the scab trains were passing through Annfield Plain on the way from Tyne Dock to Consett they were met by local workers who subjected the train to “severe stoning.” In Shildon a strike locally known as Knox’s strike resulted in 540 armed troops being deployed in the town to protect scab trains. In Darlington a further 1,000 troops were deployed to quell local unrest. While the Great Unrest has been seen by labour historians as involving leading sections of the working class such as miners, railway workers and dock workers other groups of workers, usually unorganised, were also drawn into taking strike action. For many it was the first time that they had taken any action, including large numbers of unskilled female workers. There are reports of women confectionery workers in Bristol walking out of their factories and calling out other factory workers, in London female garment workers also took action as well as department store workers. 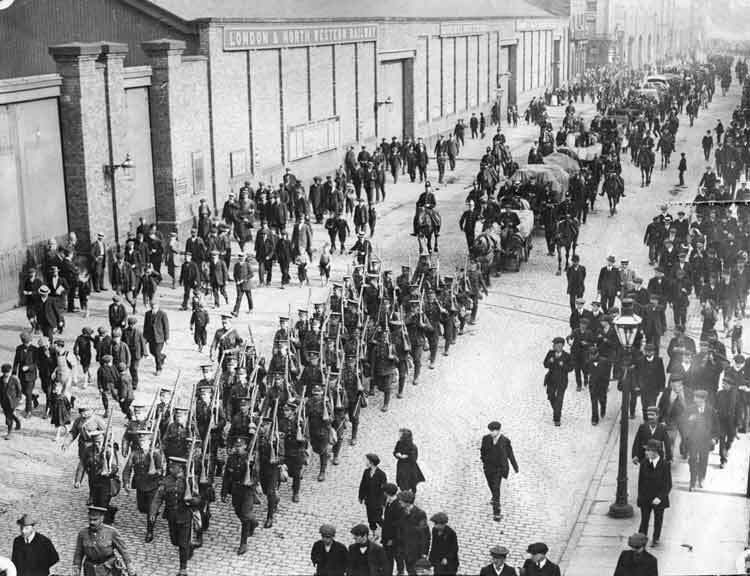 The period 1910- 1914 also saw a massive increase in the instances of labour unrest throughout the Clydeside region. Working days lost to strike activity in these four years were four times the level recorded for the whole of the previous decade 1900-1910. The most famous of these was the strike of 11,000 workers, started by women, against pay cuts and workload increases at the Singer Sewing machine in Clydebank. Here too an integral feature of the strike activity of this period was the radicalisation of previously acquiescent groups of workers. During this period women and unskilled workers played a significant role in fighting for better wages. It was this outpouring of workers’ anger, which had been pent up for years, that troubled the bourgeoisie. By 1913 it looked as if the strikes were beginning to develop and to increasingly draw in fresh layers of workers. Even with the defeat of the Dublin lockout in 1913 Lloyd George (then Chancellor of the Exchequer) believed that 1914 would see an even greater strike movement develop and may have led to more serious confrontations with the British capitalist state. However this wasn’t to be as the British bourgeoisie with the rest of the European bourgeoisie took the working class into the first great slaughter of modern times, the first Imperialist war of 1914-1918. It seemed that all the class militancy that the British working class had been showing over the previous four years had dissolved like mist in the early morning light. It wasn’t long before the Labour Party and Trade Unions had declared a truce with the bourgeoisie in the name of national solidarity and were sending of thousands of workers to be slaughtered in the trenches. These gross betrayals highlighted the fact that the trade unions as well as the Labour Party as organisations were no longer in the camp of the working class rather they now became organisations whose main purpose was to defend the capitalist mode of production. Do these strikes have to teach workers and their revolutionary minorities anything today? There are some similarities. Then, as today, workers were expected to take severe cuts not only to their wages but also in their working conditions. While in 1911 more direct wage cuts (rather than wage freezes or rises below the cost of inflation) were the order of the day the capitalist class then were raking in ever large amounts of wealth on the exploitation of ever poorer workers. The ostentatious displays of wealth of the Edwardian era are mirrored by today’s capitalist class. With no productive investments as an outlet for their surplus value it is not just the bankers who celebrate their ever increasing share of the wealth workers create. At the same time many workers are now expected to take wage cuts, short-term contracts on slave conditions, or increasingly face unemployment. At the moment the response of the class to the level of the attacks is inadequate but we need to be aware that while on the surface of society things may appear tranquil beneath the surface class tensions are bubbling away. What surprised all commentators of the Great Unrest was the sudden and concerted explosion of class anger in 1910-11 that appeared as if from nowhere. We are in a similar situation today as millions of workers are being ground down by employers as seen, not only in the attacks on today’s conditions, but also on their future via the pension cuts. The Great Unrest also shows clearly that economic militancy alone is inadequate when faced with the challenge from the bourgeoisie and the capitalist crisis. Recognising that the class anger exists is not enough what is required is a revolutionary Marxist organisation that is armed with both a strong theoretical base as well as an organised existence within the working class. During the Great Unrest the relatively new Labour Party was able to claim to be a “their” party to the mass of workers. While the Labour Party was being criticised by revolutionaries such as John MacLean (see above) over their antics in parliament where they copied the policies of Liberal Party as millions of workers were starving due to either low wages or unemployment there was a general acceptance that it was somehow “socialist”. Thus organisations like Maclean’s British Socialist Party or the much better, but much smaller Socialist Labour Party, found it difficult to demonstrate how anti-working class the Labour Party was. At the same time workers had not been broken from nationalism as can be seen by their enthusiastic volunteering for the debacle of the horrors of the first Imperialist war. Today there is little enthusiasm for Labour but that does not stop many self-proclaimed “socialist” and “revolutionary” groups like the SWP or the Socialist Party from acting as its cheerleaders. By calling for the Lib-Dem Coalition to be voted out they really mean “Vote Labour”. Revolutionaries today are not only faced with these Trotskyist and Stalinist leftovers but also have to fight the intense political cynicism about political action in general. Some take comfort that most of this cynicism is expressed towards the official parties but the attitude that all politics is a waste of time is ultimately useful only to the capitalist class. After all they need only our acquiescence to carry on exploiting. This brings us to a final thought on the Great Unrest. Workers back then had a great trust in their “leaders” but found that they had feet of clay. In 1911 Liverpool workers booed Tom Mann (portrayed as a great revolutionary by Communist Party historians!) when it was clear he was trying to negotiate an unacceptable deal. They could not understand how the union was letting them down. A century on and it has happened so many times that workers are less likely to accept what the union tells them. Increasingly across the world they are also recognising they need to actively take control of their own struggles and set up assemblies and strike committees to organise the way to fight. Revolutionaries too need to be active. We need to be involved with today’s struggles to build a revolutionary Marxist organisation rooted within the working class that pursues an internationalist strategy of uniting all workers in the struggle against capitalist exploitation and to ensure that the working class wins political power. Let’s make sure that during the next period of great unrest the working class can emerge in a stronger position to challenge the bourgeoisie for political power. very interesting... i haven't heard about this page of class struggle until now. Thanks No Nick the Great Unrest was one of the incidents in working class history that the bourgeoisie fears and the left of capital dreads. Here we have a young generation of workers developing their own forms of struggle to deal with the attempt by the bourgeoise to drive down wages and lengthen working hours. What this means for us today is not to rely on the unions but to rely on our own class initiatives that will threaten and then overturn capitalist rule not only in the UK but globally. A very interesting look into class history and comparison with today. The following paragraph caught my eye. At the moment the response of the class to the level of the attacks is inadequate but we need to be aware that while on the surface of society things may appear tranquil beneath the surface class tensions are bubbling away. I think it's always healthy for discordant notes to be introduced so thanks Kinglear it got me thinking about what I was trying to get across in the article. I'm going to have to check out the ICC's "subterranean development of class consciousness" (sdcc) that you mention to see if it corresponds to my thinking which is that while the working class in the UK has not yet rose to the challenges of the austerity cuts implemented by the bourgeosie this does not mean that the working class is either apathetic or content with it's collective lot. There is evidence that workers are becoming increasingly dissatisfied with seeing their standard of living being cut and are begining to start to fightback in the forms of strikes. There have been a rise in strikes in the public sector while under the control of the unions is still a step in the right direction. The sdcc seems to me to argue that the actual development of class consciousness is dependent on something other than the actual material relations based within the capitalist mode of production. As i said I need to check out the ICC material before getting back with an adequate reply.